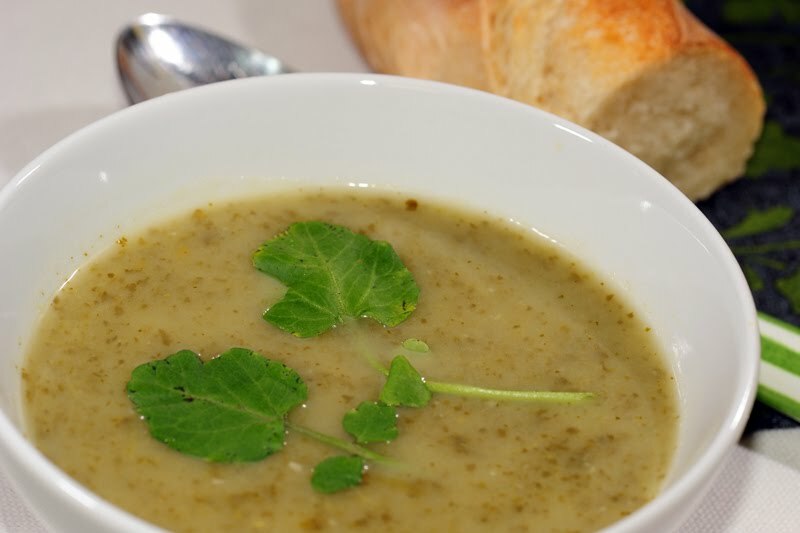 This is maybe the easiest soup to make and a real favorite in my family. I was actually surprised how easily my two children ate their first bowl of watercress soup. You know, I was doing the "prep" talk (something like "we are going to have watercress soup tonight; it's really good, both papa and I love it; I was even maybe starting to tell them how I made it, just to keep them interested). I put their bowls on the table with a little bit of apprehension, waiting for their reaction. Part of me was already prepared to push for "at least a few spoons"... but no! My older child looked at me and said "c'est bon". My younger kid could not talk yet but by the speed he was gulping his soup, I could just tell that he was enjoying it! Blessed with this great success, it has become a favorite on my menu list. I also serve it over couscous; it makes a great dinner dish and it's easier (and less messy!!) to serve to younger children. I personally love watercress in a salad; however, you have to trust the quality of watercress you are purchasing to eat it raw because of potential parasites (pregnant women should avoid it raw). I also like it just sauteed in olive oil as a side dish with lamb chops for instance. But, for my children, I am not going to serve them raw or sauteed watercress for another few years. Right now, I am just really happy they like it in a soup. I just have to plan to make more because one bunch is not enough for all of us anymore! Bon Appétit! In a pot (with lid), over medium-heat, saute the onion and garlic in olive oil. Add the watercress and potatoes and saute until the watercress is a little wilted. Add about 3 cups of water : you want the vegetables to be covered. Put the lid on and simmer for about 15 minutes or until the potatoes are soft. Blend thoroughly, discarding some parts of stems that don't cooperate! Add salt and black pepper to taste . Serve with crème fraîche, grated cheese, toasted bread. I (and my children) like the watercress soup to be really smooth. That's why I cut the watercress stems before cooking them so that they blend more easily. I am a soup fan. Sounds delicious. Will definitely try. I'm looking forward to making this recipe. I don't think I've ever bought or made anything with watercress before so this will be a nice way to try it! I like it when you tell us how your kids react to the food! Funny! I love this one. I bought too much watercrest and after salad used the rest for soup. La maitresse de maison l'a faite; nous l'avons goutee; c'est tres bon. Nous vous recommandons cette recette (comme les autres..naturellement)!!! will be trying this one too, but i think i'll add some of the vegetable bouillon i have in the freezer to the cooking water.